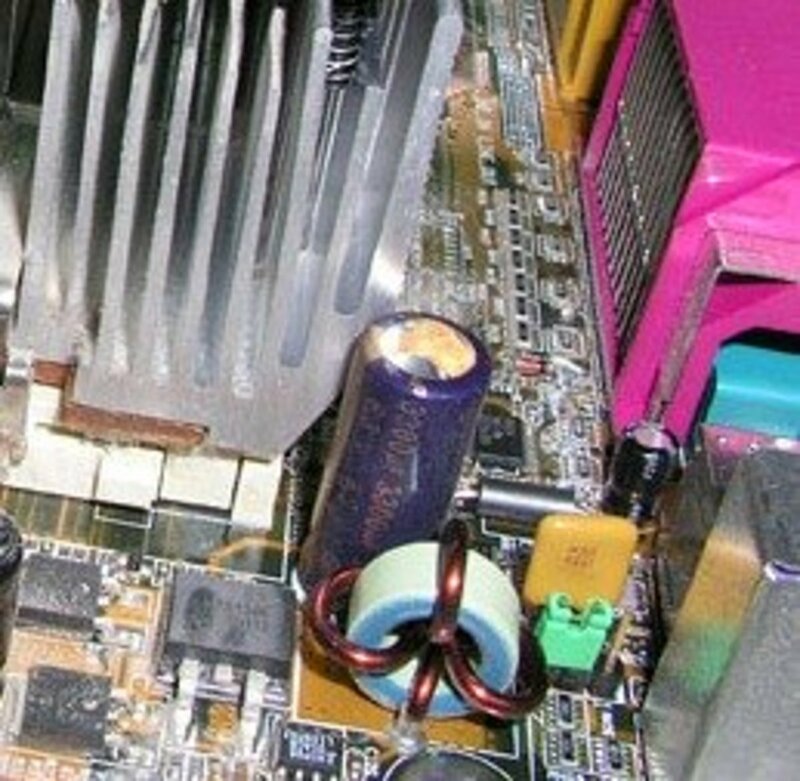 LED TV's have a known problem with capacitors going bad. 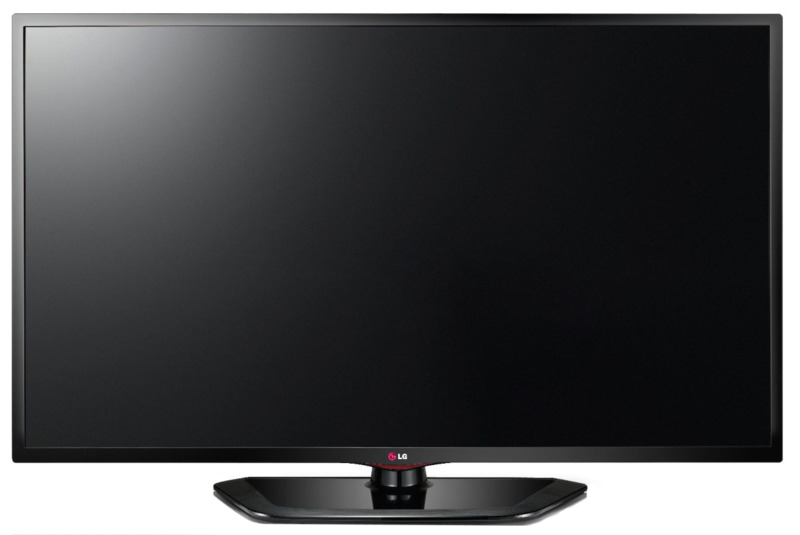 If your LG LED TV won't turn on, or makes repeated clicking sounds, there is a very good chance that you can save hundreds of dollars doing this simple repair yourself. I know, I know. You're thinking, "Tinker inside my LED HDTV. Are you crazy?" No, I'm not crazy. 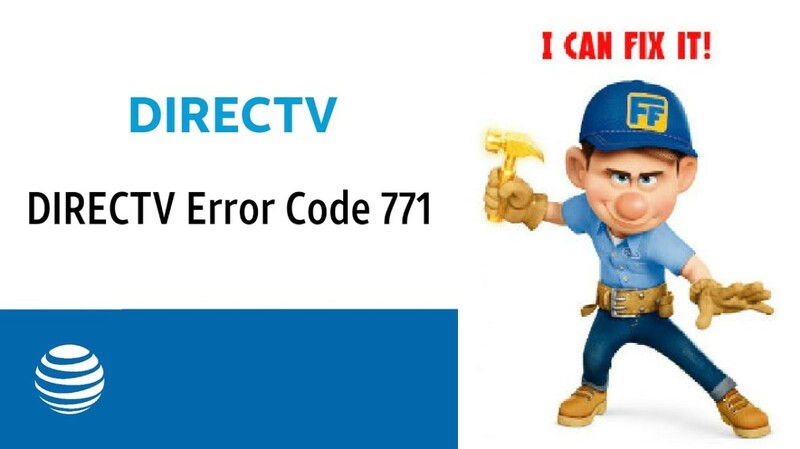 This is a repair almost anyone can do, it's actually quite simple, and with only a few basic tools and about 20 bucks, you can have your TV working in less than an hour. 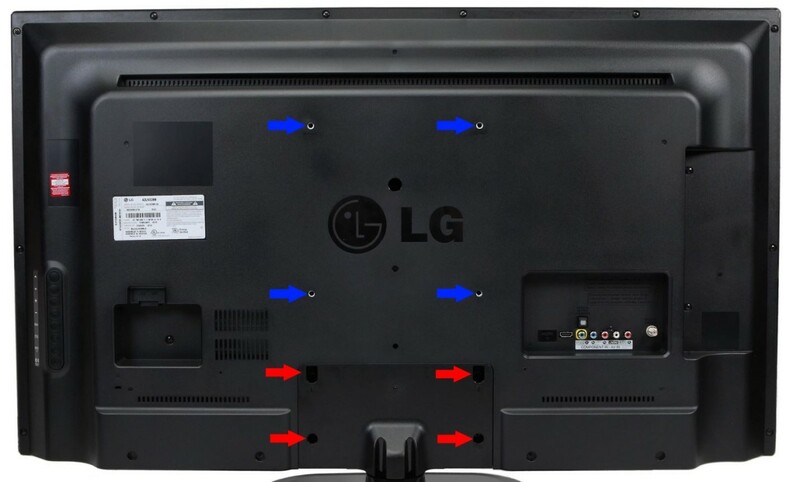 The step-by-step repair below was done on a LG 42LN5300 LED HDTV, but this easily repairable solution can be performed on any Flat Screen TV. But I don't have a LG TV! Don't worry. The steps below will help you repair any brand of TV. 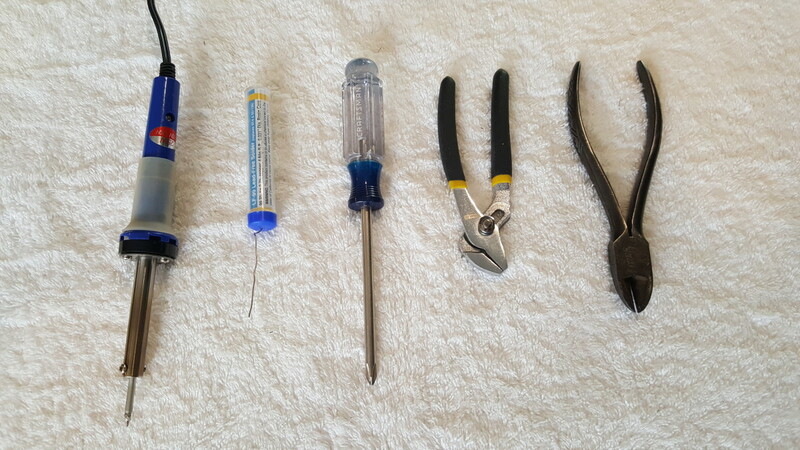 Need a soldering iron? No problem. They are cheap and easy to use. I highly recommend the J&L 60 Watts Soldering Iron. It's about 20 bucks, or if you're looking for the lowest price possible, this 60W soldering iron with stand is about $8 (shipped prime) and will work just fine. 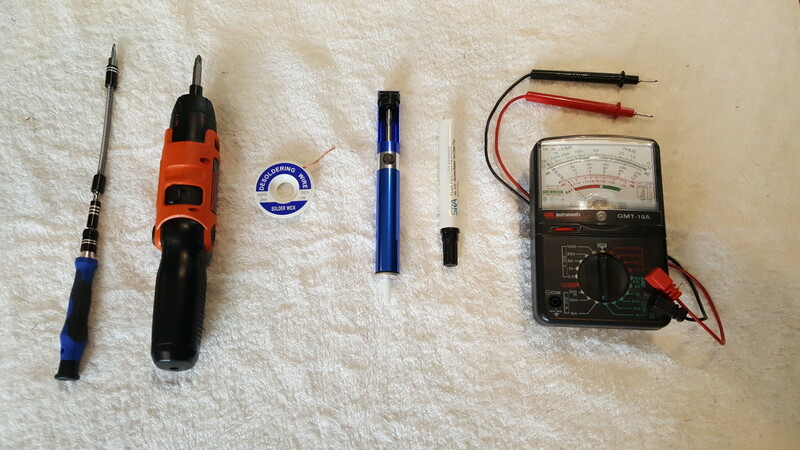 These tools aren't required, but they can make the process easier. After unplugging everything on the TV, you will need to remove the stand. If your TV was wall mounted you will need to remove the TV from the wall, and remove the mounting bracket from the back of the TV. 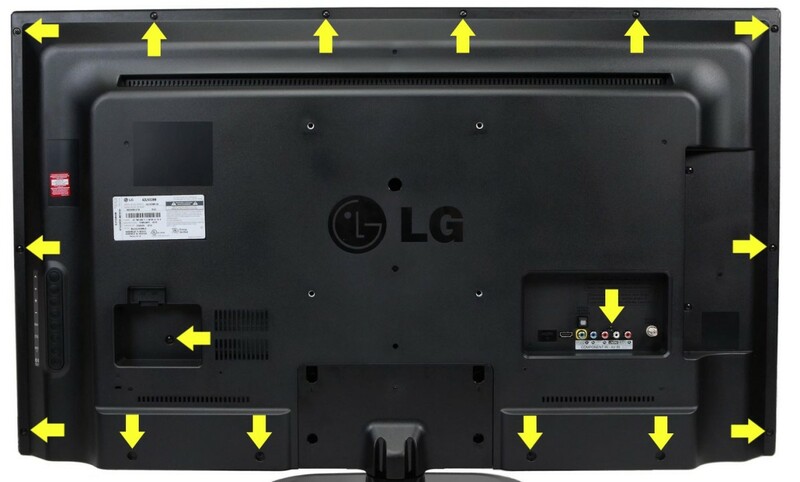 Red arrows: Remove these 4 screws to remove stand from TV. Blue arrows: Remove these 4 screws to remove a wall mount (not shown) from your TV. The TV sits on top and inside the stand, so it wont just flop over when you remove the stand screws, but it's always safer to have a friend hold the TV upright as you remove the screws from the stand. Then each of you grab a side and carefully lay it flat on a carpeted surface. There are 16 screws to remove that will allow the back casing of the TV to come off. Remove all of the screws shown at the "yellow arrows" below. Removing all of these screws is made much simpler using a cordless or ratcheting screwdriver. When handling your TV always keep it straight up (like your watching it) or laid flat. Any force applied at odd angles can damage the fragile glass front. With the back casing removed locate the power board (pictured below). 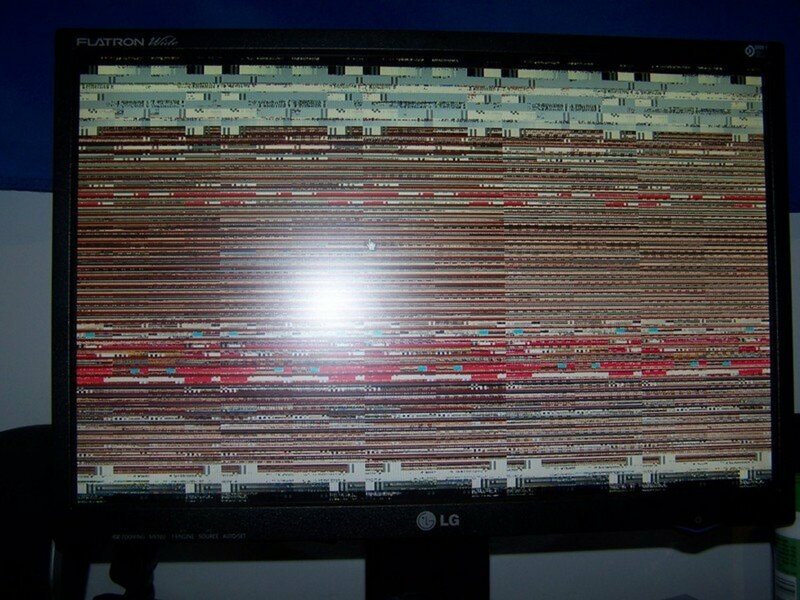 If you're not working on the LG 42LN5300, your power board will look different, but the process is the same. 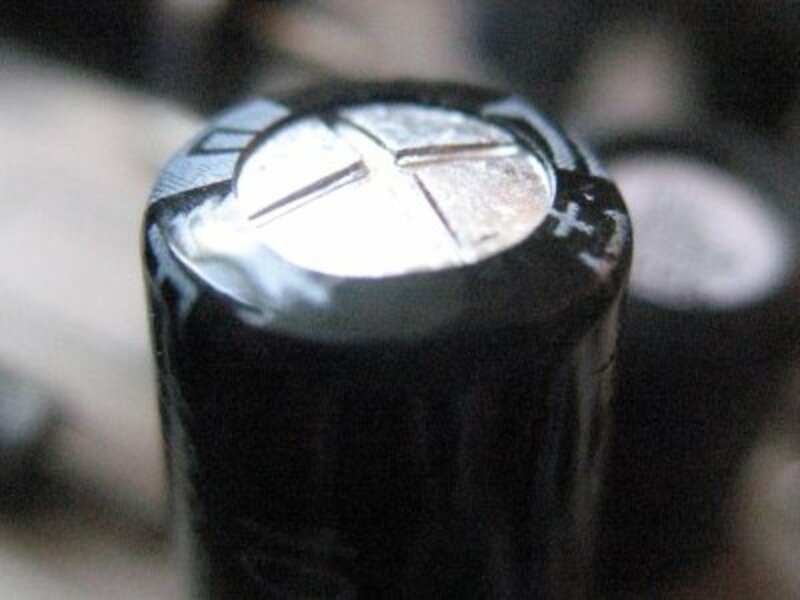 Usually, but not always, capacitors will show visible signs of failure. There are two main types of visible failure. When it fails, the chemical reaction inside the capacitor can produce hydrogen gas, so capacitors have vents cut into the tops of their aluminum cans. These are intended to break and release the gas that has built up inside the capacitor. So, a capacitor which has failed can show bulging at the top. Below is an example. Another sign of a failed capacitor is leaking fluid (electrolyte). 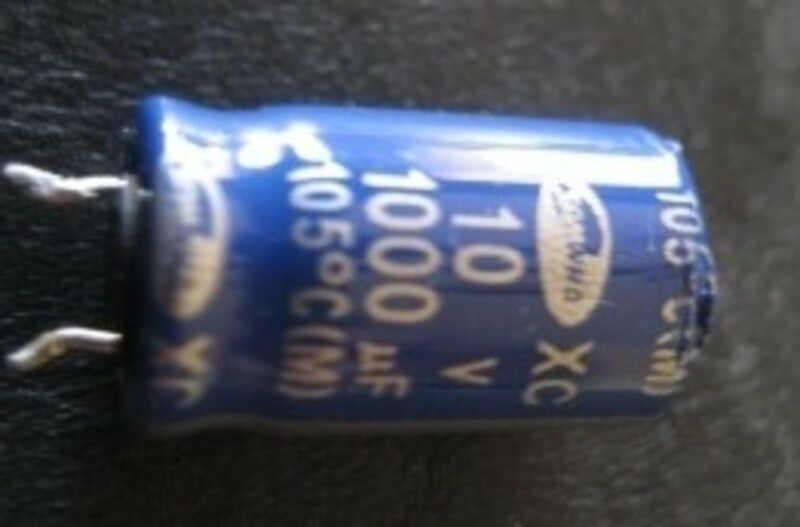 This can be an orange or brownish discharge from either the top or bottom of the capacitor. Usually a leaking capacitor will also be bulging. But not all bulging capacitors are leaking. On the LG LED TV power board pictured above, I have indicated which capacitors you should be examining for signs of failure. The Capacitors are Aluminum Electrolytic Capacitors, and are the most likely cause of your problem. Don't worry if your board looks a little different. Simply examine all Aluminum Electrolytic Capacitors and usually the faulty one(s) stand out. Note: Do not bother with the large capacitors (2 or 3 will be on every board). These are high voltage, rarely fail and for safety require a little more expertise to work on. Capacitors have polarity. What this means is, like a battery, they have a positive (+) and a negative (-) side. 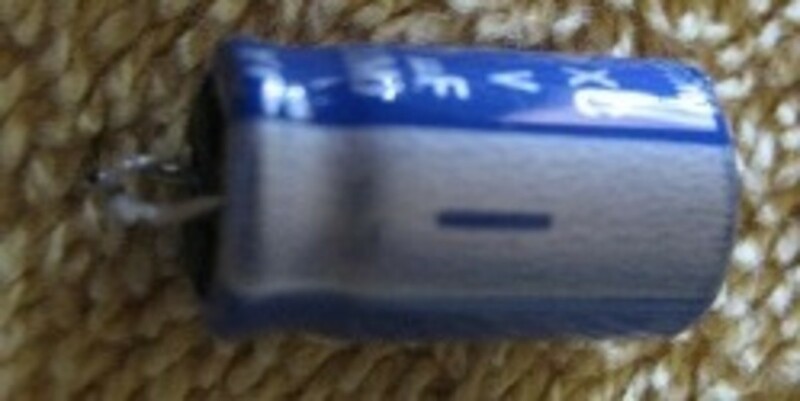 Before removing any capacitor, note which side the white stripe of the capacitor is facing. You will need to put in the new capacitor in the same direction. Takes Notes or Take a picture, or you will ruin your TV. 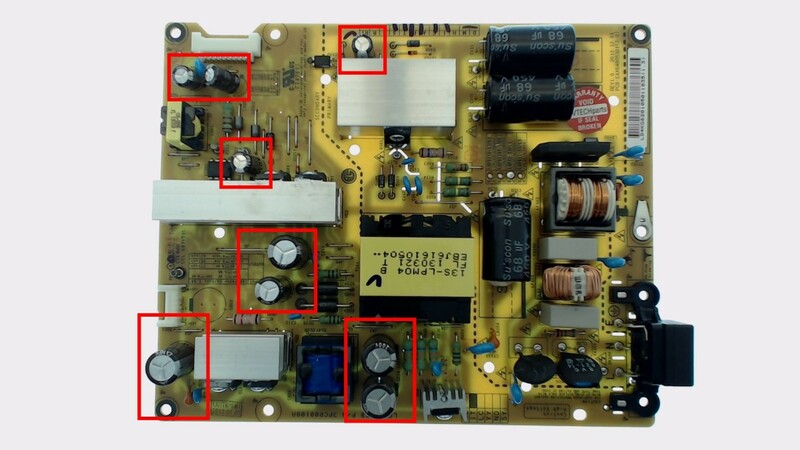 Now that you've identified the capacitors that look bad, turn the board over and carefully identify exactly which points on the board are from these capacitors. Circle them with a "sharpie" type pen to keep track. Grab your friend and have them help you on this next step. 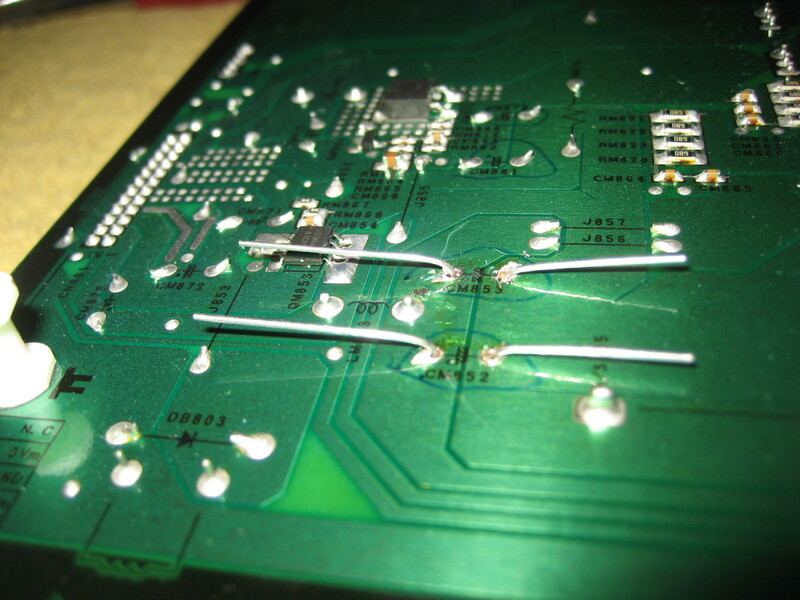 Balancing the circuit board on its side while using a hot soldering iron and pliers can be a bit tricky. Plug in the soldering iron and give it 10 minutes to get hot. With the circuit board on its edge, have your friend grab one of the capacitors with the pliers and apply a very gentle pulling pressure. 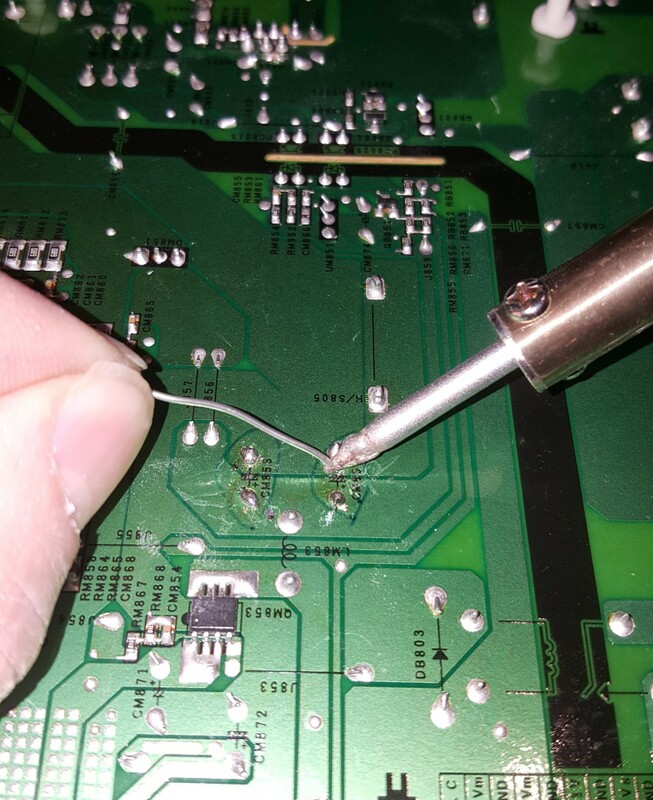 Apply the tip of the soldering iron to one lead on the back side of the board and hold it there until you see the solder melt. Now switch to the other lead until it melts. Keep going back and forth on the leads. Each time the solder will melt faster. After going back and forth a couple times the capacitor will easily come out. Repeat for each capacitor that you are replacing. 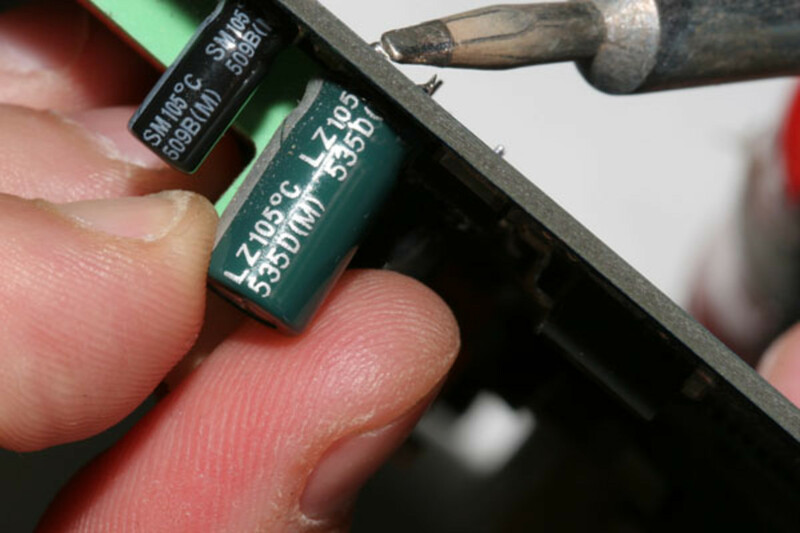 Use desoldering wick or a solder sucker to remove solder from a capacitor lead. Let the Soldering iron do the work. If the capacitor does not easily pull out, do not force it. Having found and removed the bad capacitors on your board it's time to buy new ones. Ideally you should match the uF and the temperature rating exactly. 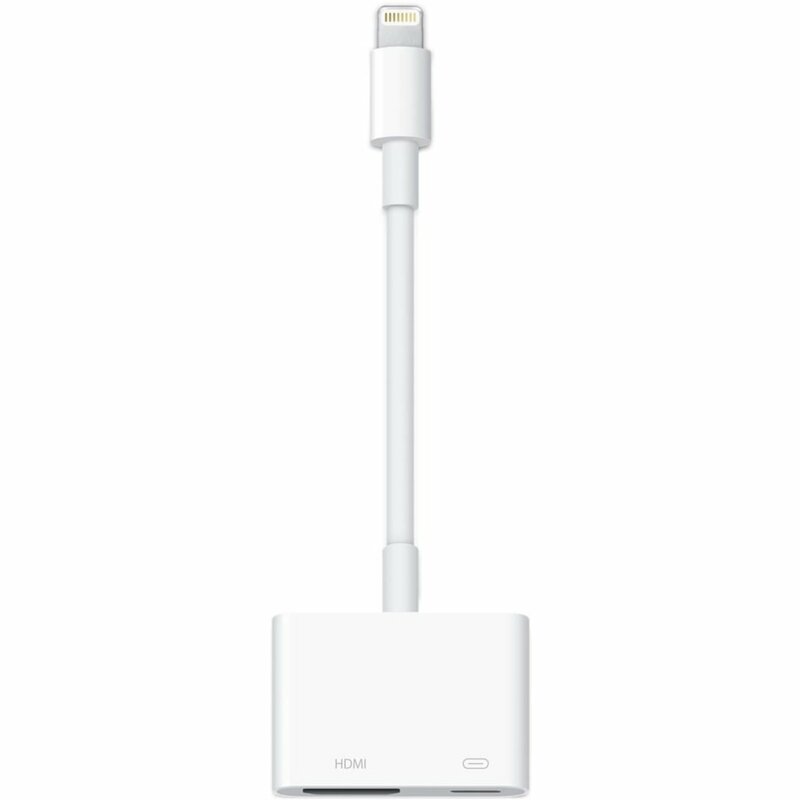 But it is acceptable to use a capacitor rated higher uF if it is within 20% of the original. Match the temperature rating, but you can go higher if needed. Not Lower! Match if Possible. You can use a larger value if needed. Not Lower! Often you can find replacements capacitors at your local electronic store. 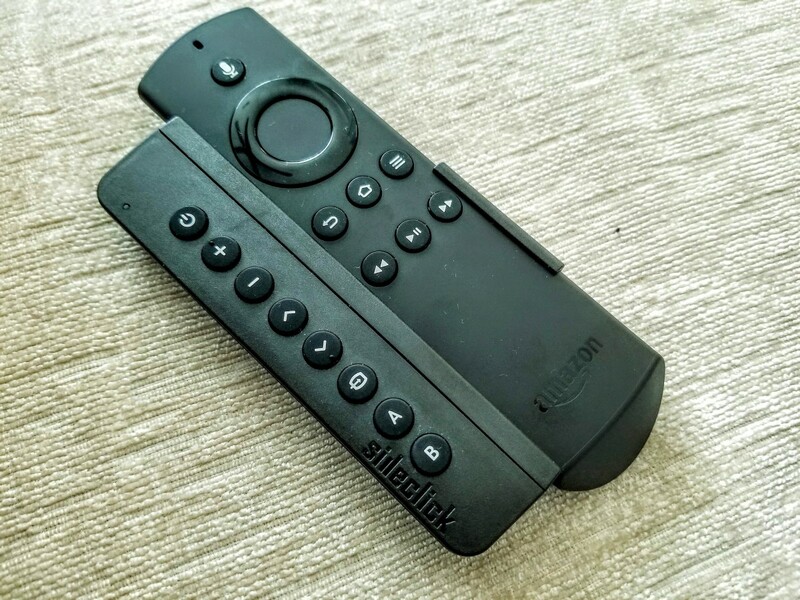 But it may be easier to buy replacements from Amazon.com. If your replacement capacitors don't match exactly what was removed, write the original values on the circuit board with a sharpie. If you ever have to replace them again you want to try and match the original values. Insert capacitor, making sure to place the negative side in the correct location (look at your notes or pictures and confirm). 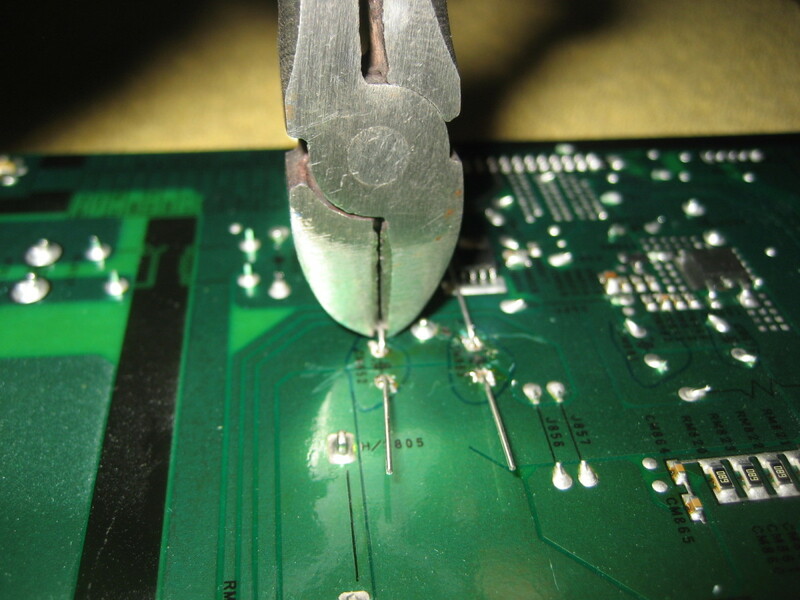 If there is hard solder in the hole, simply apply the soldering iron until solder melts and slip capacitor leads in. Bend back the leads to hold the capacitor in place. Carefully clip the leads so that only about 1/8" is protruding. Place your soldering iron and solder on lead until the heat melts the solder. Once solder melts onto the lead, apply the iron on the lead and solder a few times to melt the solder cleanly on the lead. If you have solder flux, the solder will make a clean connection. 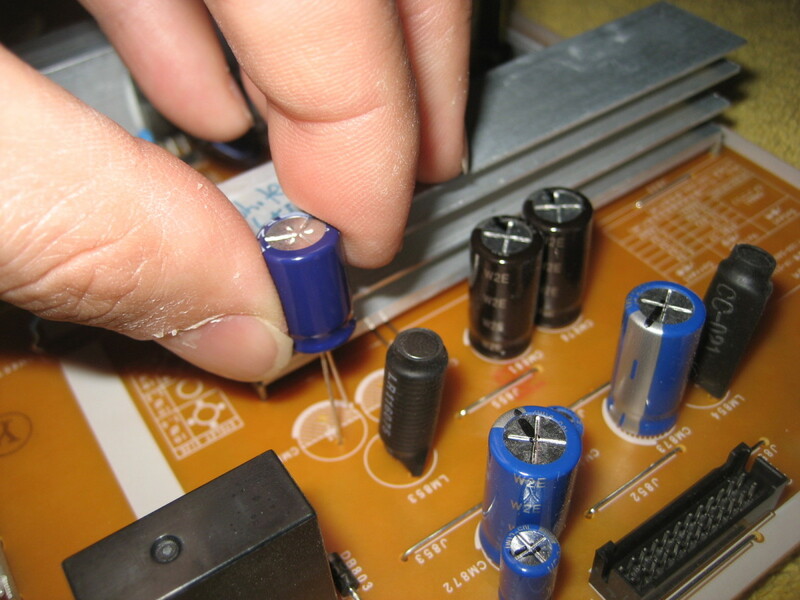 Once the Capacitors are installed clean any flux or solder residue with a damp cloth. 1. Attached the circuit board. 2. Reattach all wiring harnesses. 4. 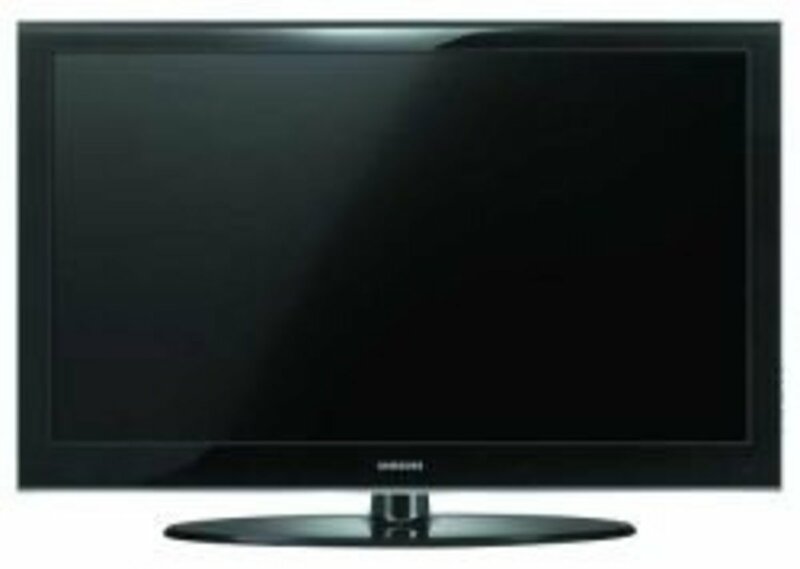 Turn on TV and be happy that you save yourself a ton of money. This fix works. It worked for me, and it worked for hundreds of people reading this and my other articles.